The subway isn’t the place you’d think to go to for entertainment. Who’s interested in anything associated with stress and mad scrambles to get from Point A to Point B? But trains can hold your attention (at least the people on them can). The subway introduces us to ordinary, yet captivating characters who spice up our humdrum, daily lives. A journey on a Mass Rapid Transit (MRT) train in Singapore will show that Mr. or Ms. Ordinary isn’t as dull as you’d think. He or she may offer a few surprises – and generate a few laughs. I have to put in a section on Singapore being a melting pot of cultures because a description of subway life here is incomplete without it. Singapore is a multi-racial nation, and the government here (and very rightly) puts a strong emphasis on harmony among the races. It is a vital part of what keeps the fabric of this society strong. One must remember, at the same time, that Singaporeans are chic and urbane. All this explains why a ride on the MRT here is a captivating one. You meet men and women of all races, who speak different languages (with English as a common language) and have quirky behaviors. Subway riding is stressful. There’s the morning rush to contend with, and people who aren’t too considerate to boot. Everyone is a little “Kiasu” (Hokkien for ‘Afraid To Lose,’ pushing and shoving to get on board trains that are too full. Many believe that others must be fans of the music they love, so they become de facto deejays. Others take up too much space with their backpacks or swing them perilously, hitting innocent fellow commuters in the process. Then, there are the too-big-sized folks who cramp you up because they take up almost two seats. Some people pretend to sleep when someone old or pregnant boards the train. Being asleep is an excuse for not giving up their seats to others who need them. These probably aren’t the Singaporeans you’d like to meet. But there are others who will make your ride a pleasant one. Some of them make you sit up because of the way they look. Others catch your attention because the things they say or do are out of the ordinary. I took a few trips on the Singapore Mass Rapid Transit, during different times of the day, and came across a few such folks. It’s time to introduce you to a few of them. Morning rush hour in Singapore begins with a mad rush to the MRT station, which has too-slow escalators and jam-packed platforms. The trains themselves resemble crammed sardine cans. 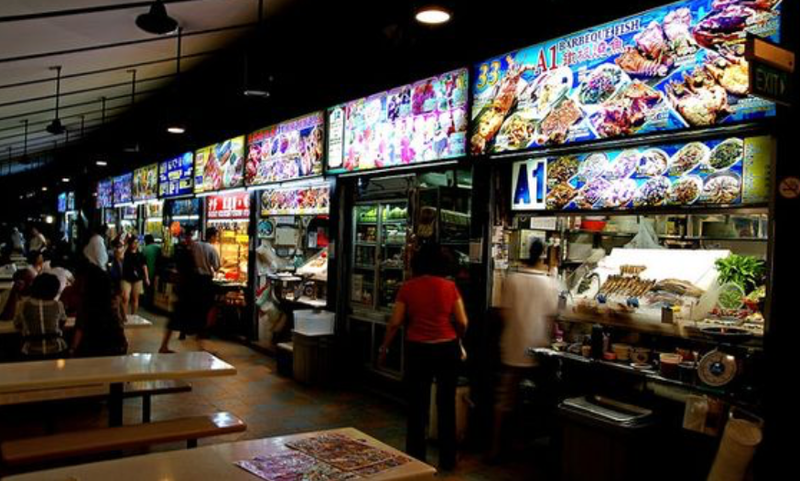 It’s at this time that you meet hassled Singaporeans from all walks of life. Frazzled company employees and anxious students fill the trains up to the brim. I first turned my attention to the students, who resemble each other in their school uniforms. Singaporean students are typically bespectacled, hunched, or pressed down by books. One of them, however, stood out during this particular rush hour. The broad-shouldered Chinese boy had well-chiseled features- he looked like an Asian version of Hollywood celebrity Channing Tatum. He sported the latest Korean hairstyle, complete with bangs, and his uniform had no creases. He seemed out of place in his well-ironed school uniform because he looked too good in it. The young boy caught me staring and gave me a lopsided grin. Dumbfounded for a minute, I let go of the grab handle and fell against an elderly, yellow-toothed Chinese gentleman who seemed too happy. You also meet the polished office worker. Office workers typically look stressed, with their hair not yet dried, as they rush to board trains. But one was different. A young, Eurasian man, he had distinct Aryan features. He bore a striking resemblance to F1 Champion Lewis Hamilton but had a better build. He wore an eye-catching yellow shirt, and his muscular frame made an ordinary pair of trousers look like a runway piece. It was the combination of yellow and black that enhanced his form. Temporarily distracted, I nearly missed a stop. I mustn’t forget to mention that the subway stops are themselves interesting. I stopped at the Newton Station for a quick breakfast of you tiao (fried dough sticks) and bean curd. I had my share of real drama when I boarded the train at about ten a.m. a few days later. This time, it was a young lady who turned heads. She was an attractive Chinese girl in a tight grey t-shirt, and floral yoga pants. They complimented her figure perfectly. She had long hair up to her waist; she smiled at another passenger, a smile that would make guys’ hearts skip several beats. Her make-up was light and impeccable. As with most subways, the trains are usually empty at this time of the morning. Those who board them at this time are typically the seniors or hassled students rushing to attend lectures at polytechnics and universities. One of the seniors, a polished Indian man in his sixties, seated himself next to the girl, who began combing her hair. Yes, the young lady had turned hair coming into a fine art. The young woman continued combing her hair. “Sure,” She went on brushing her hair. “Are you married?” The Indian man, not one for shyness, asked her directly. He looked at her expectantly. She looked him squarely in the eye and held up the fourth finger of her left hand. It bore a wedding band. “Wu Liao (nothing else to do),” she muttered in Chinese and got off at the next stop. I must say that the Indian gentleman took the rejection rather well; he shrugged and moved to another carriage. Lunch on Wednesday was a bit more humdrum than mid-morning Wednesday but was interesting nonetheless. A demure-looking Chinese girl came onto the train. Her short, eye-catching bob caught attention. Pretty though she was, she had a frown that betrayed her stress. Her phone had captured her attention. “Fan Si Ren (frustrating),” she muttered under her breath in Chinese. She had the look of someone who just had a lover’s quarrel that didn’t have the best ending. But something about her told me that she would have a new partner soon. I can’t forget to mention that Singaporeans have been enduring the frustration of slow trains. The authorities managing the MRT have been trying to correct signaling faults, but haven’t managed to address all of them yet. One of them happened during this time and caused some anger among those heading back to the office after lunch. “Sian (frustrating), some of them said. They shook their heads and ran to catch shuttle service buses back to the room. 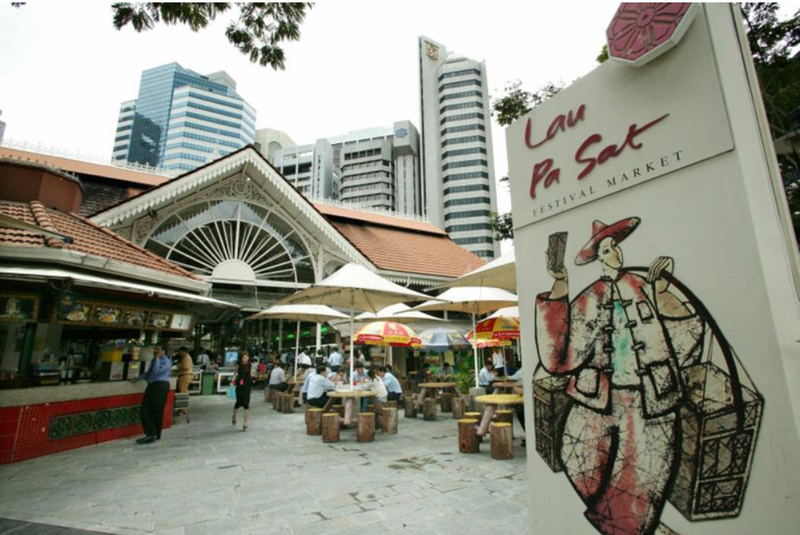 I stopped at Raffles Place and headed for Lau Pa Sat ( the old market), where I had a delightful Singaporean delicacy, chicken rice. 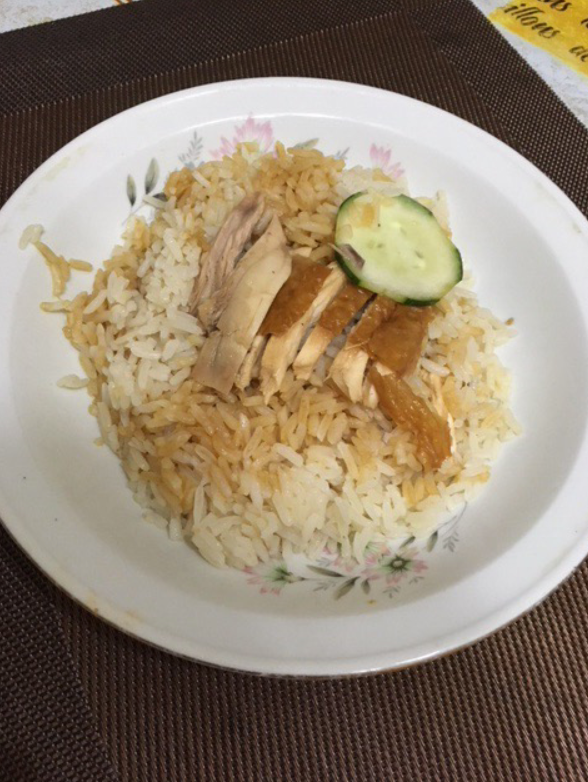 The dish consists of succulent roast chicken and rice cooked in chicken stock. The ride in the late afternoon at about 4 p.m.. on Thursday was an eye-opening experience. The people on the subway had more in-depth personalities than I thought. There was an Indian gentleman in a Magenta shirt who caught my attention because he had striking (but not handsome) looks. I overheard a conversation between himself and a friend. It turned out that he was a musician. His knowledge of music and music software struck me; I am a musician myself. This Indian gentleman was gregarious and urbane. I was hoping to strike up a conversation with him, but he had to get off at the next stop. It was a shame that he did because we shared similar interests. 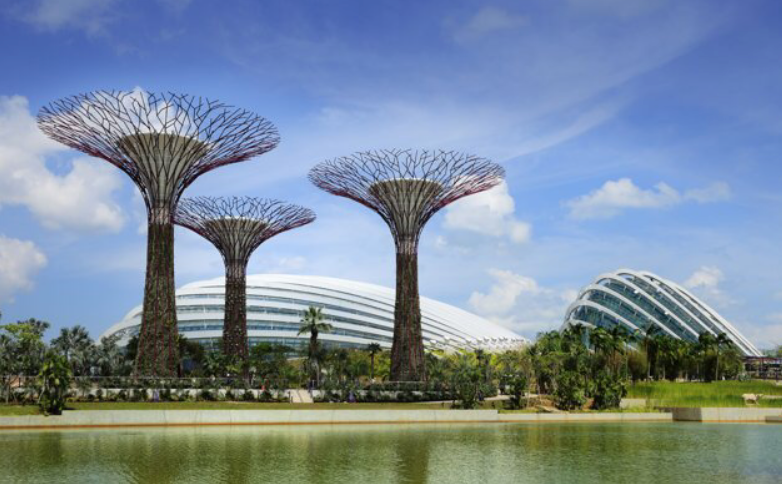 The MRT I boarded at this time stopped at Gardens By The Bay, which has tranquil lakes and treetop-like structures on top of which quartets play symphonic music. Evening Rush Hour Fri 6 p.m. The evening rush hour ride on Friday was an amusing one. A man wearing a surgical mask boarded the train. I felt torn between extending empathy and rolling over with laughter. The guy looked a bit odd going about with his face covered. He was pudgy and had a squarish frame. I’m glad that I chose empathy because he told me while on the journey that he had a “gan mao” (flu) in Chinese. He said that his mask was his way of showing concern to the people around him. I stopped at Northpoint at Yishun, in the Northern area of Singapore for dinner. 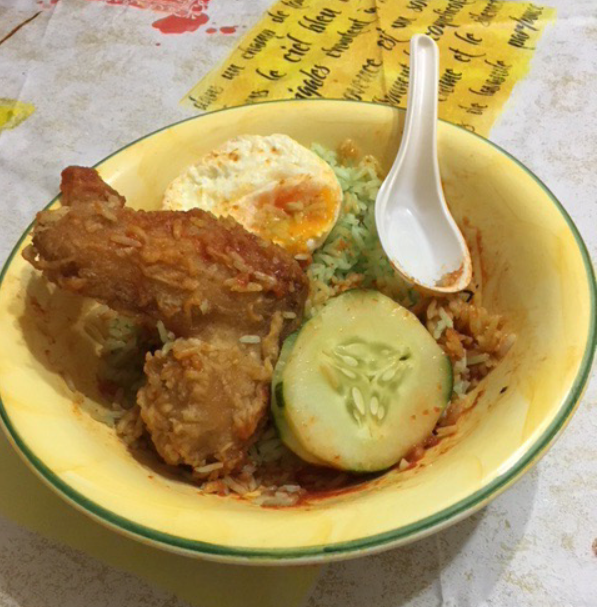 I shared a feast of Nasi Lemak, or coconut rice, with side dishes of egg, a chicken wing, and cucumber. In all, you don’t always have to pay for your entertainment. 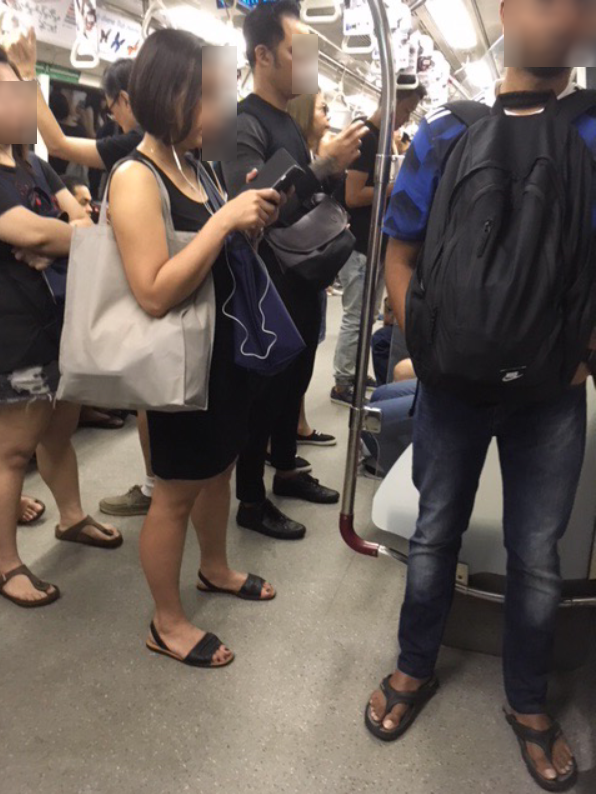 A ride on the MRT is more than enough to keep your mind occupied.